TGALT's Life Members are recognised for their commitment and contribution to the association. We believe it is important that their extraordinary work is recognised. Here are their stories. Noel Jetson. Life member since 1994. As a lover of trout fishing and an avid enthusiast of fly fishing from a very early age, Noel Jetson was a "legend in his own life time" to the Tasmanian freshwater angling community. His tackle shop at Cressy was the 'must see' stop on the way to the highlands or streams of the North for the latest in fly designs and advice. One paid for the flies but the advice (especially to the budding young fly fisher) was always freely given and warmly received. The fly patterns developed by Noel were often simple in design, beautifully made and VERY EFFECTIVE. Many are still recognized as Jetson originals and feature prominently in new or revised fly fishing publications, e.g. The Noel Jetson 'Black Spinner' featured in Peter Leuver's "Fur & Feather" (forward by the former Prime Minister Malcolm Fraser) still accounts for many a wary brown on lowland or highland waters. Noel's six best flies are listed in book by Malcolm Crosse, "Australia's Best Trout Flies". 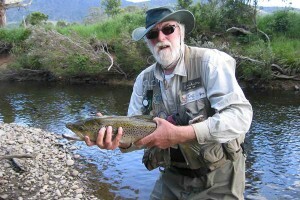 Noel Jetson was the first trout guide in Australia and guided for four years in New Zealand. 1. Providing the best levels of service to the visiting angler. 2. Developing a system of accreditation that protected the visiting angler and set the standards for guided angling in Tasmania. This was the first accreditation system of its type in Australia, and at the time many thought he was mad to believe one could make a career out of guided angling. Not only did Noel succeed at this, but by 2002 TGALT had 20 accredited full guiding operation members, plus ‘house’ guides and Affiliated members whose businesses are directly associated with trout fishing in Tasmania. A total membership of almost 30 professional businesses. The Association is recognized as the industry's accreditation and marketing body by all areas of Government and the ideals and aims established by Noel are as relevant today as at any time since their inception. 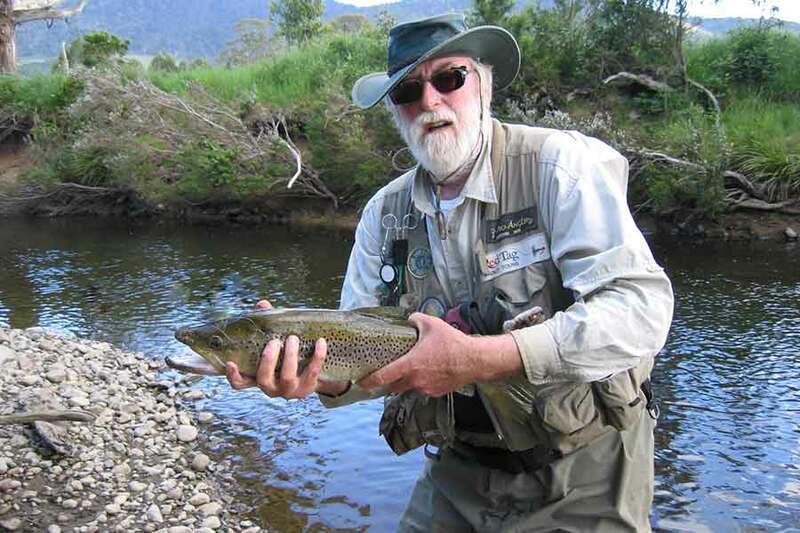 Noel was also the first Tasmanian trout guide to promote our island's magnificent wild trout recreational fishery in the international market. From as early as 1980/81 he was marketing our product to the US consumer. Our Association was pleased to appoint Noel as a life member of the Trout Guides & Lodges Tasmania in 1994 on his retirement from guiding. 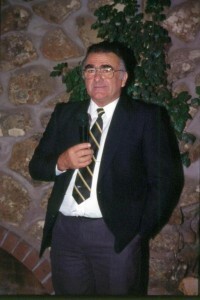 In 2002 Noel was inducted in the Tasmanian Angling Hall of Fame. Noel was an active supporter of Tasmanian recreational fresh water angling, being involved in the Hobart rally to appeal against the AQIS decision to drop Australia's quarantine standards against imported diseased salmon products. He appeared before Senate enquiry into that decision to help present Tasmania's case to have the decision reversed. He continued to have an active interest in the Association's affairs, regularly attending the Association's annual meetings, IFC activities and always on hand to give assistance and advice to people interested in recreational fresh water angling. There is no doubt that the Tasmanian fresh water angling community is far richer for Noel Jetson's support and life time involvement. Noel Jetson died on 10 March 2016. Noel Jetson. A Tribute. Text courtesy of Roger Butler. 2002. Ken Orr. Life member since 2011. Ken come from a long line of dedicated fly fishers, both his father and grandfather were well know Tasmanian fly / trout fishers, introducing him to the joys of fly fishing for trout at the age of seven. Fishing the lakes, rivers and streams around the island has given Ken a wealth of local knowledge and made him one of the state's most experienced trout fishers. His love of, and inventiveness in fly tying has given rise to a number of Tasmanian patterns emanating from his vice, such as the '007' (Licence to Kill) nymph, the Mark II Woolley Bugger and many more. Ken was the first professional guide to work with Jason Garret when establishing London Lakes, in its time one of the top five trout / fly fishing lodges in the world. He has been heavily involved with the Tasmanian Angler's Hall of Fame and the Tasmania Trout Museum on both committees at various times including Chair. Along with the late Noel Jetson, Ken was co-founder of TGALT in 1979 as its original form - Tasmanian Professional Trout Guides Association. His roles within the association have ranged from guiding member to President and many in between. He has travelled the world promoting the island's wild trout fishery and worked with numerous Tourism Tasmania staff and management to lift the state's national and international profile. He has been instrumental in getting leading world renown anglers, fishing photographers and writers to Tasmania to give our fishery world wide media coverage. 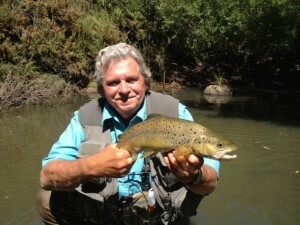 Tasmania's present position as Australia's Fly Fishing Capital for trout is largely due to his continuous promotion and support of Tasmania's wild trout fishery. Ken has worked tirelessly to lift the standards and safety of guiding to visiting anglers to Tasmania. Roger Butler. Life member since 2014. Owner/operator of Red Tag Trout Tours. Roger was born in the UK 18 April 1947, and migrated with his parents to Burnie, Tas, in late 1950. Educated at Montello Primary (Burnie), Glenorchy Primary, Hobart Tech College then Matric in Hobart. Roger was Assistant Accountant AV Jennings - Hobart & Melbourne, and from 1968, Roger was accountant, finance director & Company Secretary at Leo Burnet Advertising (now Clemengers Tasmania), co-owner of same from 1983 till 1993 when sold to Clemengers Australia. At age 6, Roger started fishing with his father in north west Tasmanian rivers, spinning for Australian salmon. Roger was introduced to trout fishing around age 10 and to fly fishing at age 15. Roger loves rivers and streams, light gear fly fishing as a personal choice. Roger was a member of London Lakes Stream Development Programme in the 1990s, and an initial member of the Hobart Fly Tiers. General - Co presenter and writer: the TGALT - National Senate AQIS review on imported salmon products. Financial - Treasurer: initiated annual external audits of association financial affairs from 1998. Represented TGALT: on the AAT development and was initial Treasurer of both Marketing & Anglers Access Grants in that role. Marketing: Developed annual Marketing Plans with key partners Tourism Tasmania and IFS, ongoing today. Coordinated: targeted consumer shows both national and internationally since 1998. Manager and co-initiator: of the 150 years of Tasmanian Trout Anniversary marketing strategy that involved all media facets including the first 1hr show, 150th documentary on iFish national TV, Foxtel and YouTube. Total input value $40,000. Co-creator and producer: of the 150 years Anniversary photo competition - local, national and international coverage and entries (250+). Raised support valued at $30,000. Continued contributor: to VJP and other FOC promotional opportunities for Tasmanian trout fishing. Text courtesy of Roger Butler. 2016. 2018 Great Lake Tie-In & Take a Kid Fishing! Tasmania offers the ultimate in trout fishing. The myriad of rivers and streams, lakes and tarns are an angler's paradise. It's a beautiful, unspoiled environment that attracts trout fishers from all around the world. Whatever your preference, still water, stream or private fishery, maximise your angling opportunities for wild brown trout by using a professional, accredited guide. Our Trout Guides, Lodges and Private Fisheries are here to help you have an unforgettable trout fishing experience.